It has only been in the past few years that I have come to appreciate brussels sprouts. It’s not that I ever had an aversion to them but I just simply was not exposed to them. 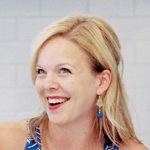 They weren’t something my family ever made and given their stereotypical bad reputation in the vegetable world, I never had much interest in pursuing them further. However, Josie’s winter vegetable chopped salad (aka one of my favorite dinners EVER) changed that for good. Now that we have become a family of brussels sprouts lovers, this is the time of year to find more things to do with them. 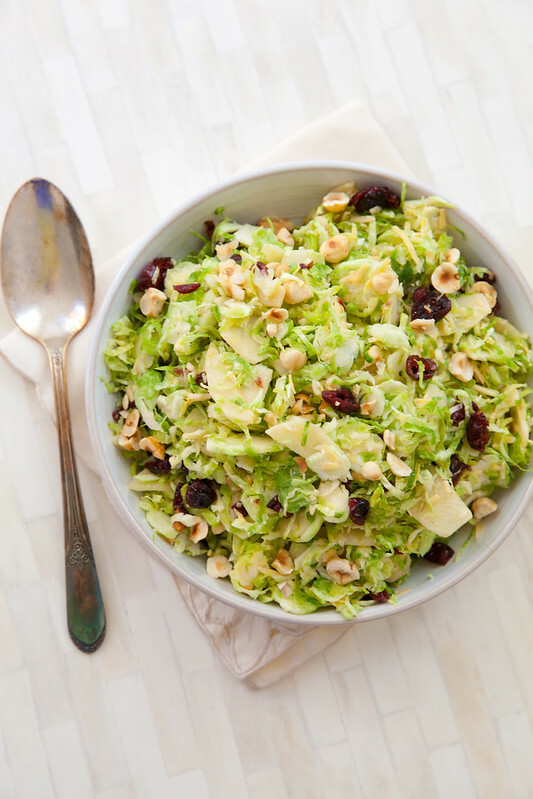 Shaved brussels sprouts salads seem to be all the rage these days and everyone seems to make them just a little bit differently. I have had a few variations in restaurants and eventually determined that my favorite combination featured shredded gouda, apples, dried cranberries and a light lemony dressing. This salad is wonderful as a stand alone light lunch or as a side as part of a larger meal. This would be an excellent contribution for Thanksgiving since the vegetable actually shines here, rather than being smothered in a heavy sauce, butter etc. I know I’ll be eating this often throughout the coming winter months! Trim the ends off of the brussels sprouts. 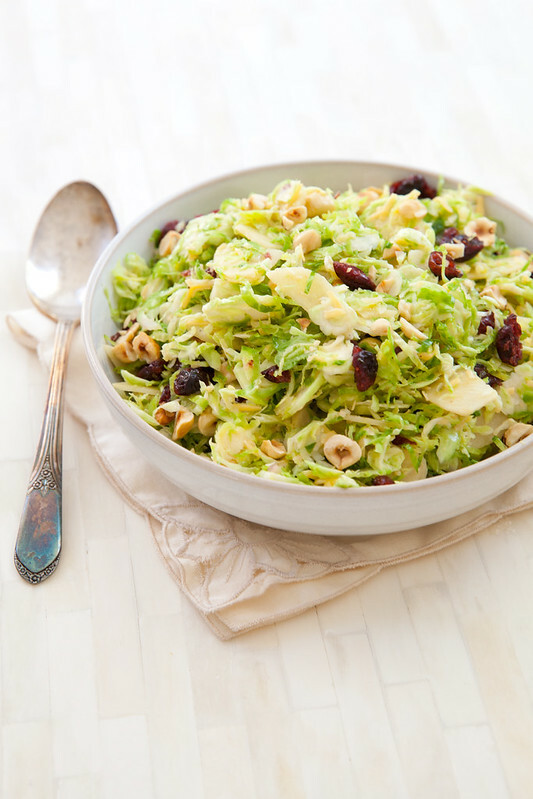 In a food processor fitted with the slicing attachment, shred the brussels sprouts. Remove to a large mixing bowl. In a liquid measuring cup, combine the lemon juice, Dijon, shallot, garlic, salt and pepper. Add in the olive oil and whisk until well blended. 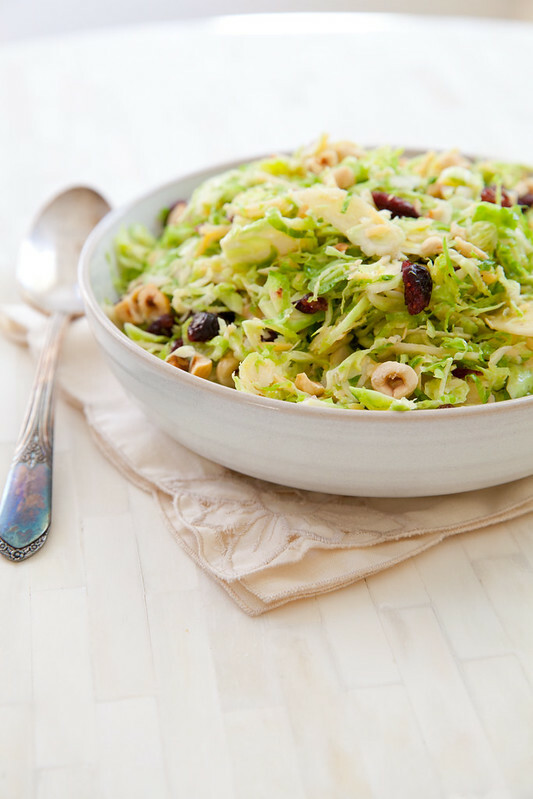 Add the dressing to the bowl with the brussels sprouts. Toss well, then let stand at least 30 minutes or up to 2 hours.